I suppose I ought to warn you at the outset that my present circumstances are puzzling, even to me. Nevertheless, I am sure of this much: my little story has become your history. You won't really understand our times until you understand mine. The individual whose present circumstances are puzzling is Agnes Shanklin, a spinster schoolteacher and librarian of Cleveland, Ohio, and her times were the early twentieth century. 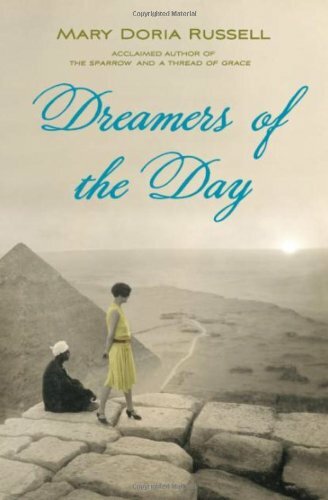 Most of Dreamers is set in the margins of the 1921 Cairo Conference—a meeting that, Russell wants us to remember, under the auspices of Winston Churchill and his "forty thieves," defined the modern Middle East. To an extent, this makes all forty-six pages of part one, in which we learn about Agnes, feel like an extended prologue. But it's beautifully harrowing stuff. Agnes describes the trauma inflicted on an unsuspecting world, and on her family, by World War I and the influenza pandemic, and the contrast between before and after is almost too much to bear. Try to imagine what a miracle of peacemaking, what relentless powers of persuasion, what Herculean intensity of physical and intellectual effort such a peace would have required! And learn this, if you wish to understand the twentieth century: Woodrow Wilson was hospitalized with influenza just as the Versailles conference began. In 1918, Agnes Shanklin is 38, the sole survivor of her family, and believes that the big questions of her life have all been answered. She's wrong; and when she uses the money she's inherited to travel to Cairo ("One needs to make new memories," she puts it to a friend) we're into the novel proper. There's one other thing to mention first, actually, which you may have noticed from the opening quote: Agnes is a lady with perspective. She knows our times, even if we don't know hers. This suggests the nature of her "puzzling circumstances," and it's confirmed soon enough: "Just between you and me," she confides, "even if you find yourself among illustrious souls, you can get awfully tired of the dead" (p. 4). Agnes may be matter-of-fact about her circumstances, but they're what makes the novel what it is. Thus are our times now linked with her times then: thus is it reinforced that just as Agnes herself has persisted, as a result of what happens to her during her Cairo holiday, so too have the political decisions made in that city. It's no accident that Before takes up forty-some pages and After only thirty; no accident that Agnes finds Cairo the most vivid of her memories. Because once in Cairo, thanks to friendships made by her deceased sister, Agnes finds herself on the periphery of the aforementioned conference. Her holiday narrative is part travelogue, part romance, and much more immediate—the rhetoric about "our times" vanishes almost entirely. But always the conference is lurking, and frequently Agnes is privy to, or a participant in, ruminations on decisions planned or taken. The Cairo conference, among other things, defined the borders of Iraq and made important decisions for what was then the British mandate of Palestine, all without consulting anyone who actually lived in the places affected. That the focus is kept predominantly on Agnes's personal adventure is quite bold, and that we don't usually get impatient for more about the geopolitical shenanigans (as in Russell's previous novels, the influence of religion on human affairs is a theme, but this time she seems more interested in the direct, raw power dynamics of colonialism) is down to the fact that Mary Doria Russell's characters always charm. Good times or ill, they always live vividly, full of spirit. They are fun people to spend a while with, even when we don't like them. 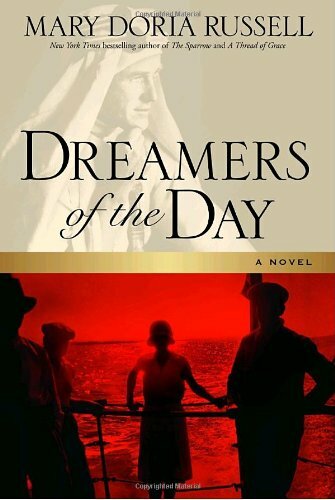 Dreamers of the Day being the book it is, many of the characters this time around are historical; I'm not in a position to judge the detail of Russell's historical research, but as characters they're as good as any she has rendered in her other novels. Winston Churchill, here a young diplomat, is fierce, forceful, pompous, and ridiculous; Lady Gertrude Bell is chilly, sharp, perhaps a little weary, and formidably knowledgeable about the region she is helping to carve up; T. E. Lawrence (of Arabia, or "Neddy"), who clearly has Russell's sympathies, is a charismatic mix of boyish guile, political acuity, and steely will. Agnes herself is self-consciously polite if privately independent-minded, an American member of the "lost generation" whose British counterparts were recently anatomized by Virginia Nicholson. Watching her in Egypt, freed from her ideas of herself, can be as fiercely intoxicating as a hot day's sun. And then every so often comes a reminder that Agnes is dead. The effect of this, which I take to be deliberate, is to break the immersion associated with historical fiction. Agnes's times are not for us to live in—they are for us to watch (as, later, our times are for her), and to read Dreamers of the Day is to take part in a game of knowingness with Agnes and her author: they know we know they know we know, and so on. So we see Agnes in conversation with Lawrence, and we interpret what is said according to our knowledge; later, Agnes discusses the events with Karl Weilbacher—a German with whom she has struck up a friendship—and he provides his own interpretation, which is then on the table for us to interpret once more. As a formal device for relating the politics of 1921 to those of our times, this is elegant and often extraordinarily effective, the more so because the tale is of sufficient complexity—and aware enough of the limits of the possible—that it cannot be summarized as a lesson. (Agnes herself tries and fails at the end of the novel.) But there are a few moments when careful indirection goes out the window. Agnes is determined that we will remember, and will understand, what she thinks we should remember and understand, so she has a tendency to lecture us when she thinks we might have missed the point, or even an implication. Fair's fair, of course: didacticism is Agnes's trade, and if a life of seeing people die before their time is up has taught her anything, it's that to remain silent is bad. It's not like she didn't warn us up front what sort of story she would be telling, either: simply look at a globe, she said, and weep. So we get digressions on Lawrence's reputation, on the religious makeup of India, and on her reaction to the family history of a German with whom she starts to become involved, and we put up with them because we accept this is a story that matters. In its closing pages, although the big-picture outcome is never in doubt, there are personal triumphs and tragedies for Agnes, but the novel never again achieves the personal intensity of its opening—or, come to that, the personal intensity of The Sparrow or A Thread of Grace . The affect of Dreamers of the Day is less specific, more general: it is a novel gripped by an anxiety of memory. At the time of writing there is, after all, no Wikipedia article for this meeting, although this is no ancient history; it is still, just, within touching distance, and, outside our enclave, is referred to as "the catastrophe of eighty years ago." But remembering that we are children of those times is a heavy burden. Certainly it sometimes seems like it might be too much for Agnes: towards the end of the novel, after an excursion to Palestine that brings home the daunting antiquity of the region, and after all the talk about the future is done, she goes for a cruise on the Nile, and finds a moment of peace. "I was glad to live in that timeless world" (p. 212), she says, and it's no mystery why. The last lesson of Dreamers of the Day , I think, is that it is no solace to remember. Niall Harrison (niall.harrison@gmail.com) has reviewed for The New York Review of Science Fiction , Foundation , and Bookslut , among other places. He blogs at Torque Control. I love Russell's writing, but upon finishing the book several weeks ago, I gave her less credit than you do for the motivation behind the posthumous narrative device. I guessed that the contrivance was because Russell desperately wanted to comment, which meant having Agnes comment, on the idea of men selling fear, but very specifically in the post-9/11 context. To me, it felt as if Russell had agonized over how to do this, and at last settled upon this (to me) awkward device, whether or not it improved the book. I enjoyed your thoughtful analysis, though, and it does make me question my conclusion. Unfortunately, I don't know that I know enough to agree or disagree -- at the very least I would have to re-read the novel, and I'm not its ideal reader because my knowledge of history is so weak (American public education -- but that's a discussion for another day!) that I know very little about the events Russell was depicting. Ah, well. Her writing is so strong that I'm willing to read anything she writes, even though I normally don't read a lot of historical fiction.